You would be thinking about the amazing health benefits a hot tub can bring into focus. It’s not surprising that inflatable hot tubs have become popular among homeowners who are looking for affordable ‘physical and emotional’ stress relief. Immersing yourself in warm water is a gentle way to exercise joints and muscles. Using a hot tub with bubble massage adds a relaxing component to the therapy. Heated water not only helps relax tight muscles but it also improves blood circulation. Soaking in your favorite hot tub provides far more benefits than simple recreational relaxation. Leisure Accents Spa Step with Storage Compartment can be a useful addition to your spa or hot tub. Let's take a look at some of the most notable features of Leisure Accents Spa Step. A hot tub is more a family hub or a meeting place. In fact, it is a party place and it is important that you keep the spa and hot tub safe for everyone. Spa and even hot tub safety is a primary concern homeowners have and simply by adding in a spa accessory such as Leisure Accents Spa Steps, you can provide the much needed degree of safety for every person who uses the spa or hot tub. Unless you choose to put your family safety at risk, spa steps are a necessity. You know that spas and hot tubs can stand several feet tall and a large volume of water is necessary for the proper functioning of your tub. While it is possible to jump in and out of the hot tub, it is never recommended. In fact, adults and children should never attempt to climb in or out of the home spa or hot tub without the assistance of safety steps. This Leisure Accents spa steps provide just the right amount of height you require for an easy transition. The durable, anti-slip coating makes these steps safe even with wet feet. Though the spa steps are lightweight and can be moved to any location you like, they stable and secure. Yes, even the little ones can use the Leisure Accents Spa Steps for moving in and out of the pool without trouble thanks to the extra wide steps. This Leisure Accents accessory isn’t just a simple step system. The model comes in two exciting colors making it easy to create the look you want. Simple gray step is classic and clean. Beige colors create the look of sophistication and can be an excellent addition to any spa setting. Safety for the home spa or hot tub comes first. And getting hands on this set of steps is the ideal way to combine aesthetics with function. You can also enhance your hot tub experience with the secret storage compartment. That’s right. The top step of your favorite Leisure Accent accessory opens up easily to reveal a spacious storage compartment. You can use the storage component for hot tub accessories, however you should never use the plastic steps to store chemicals. 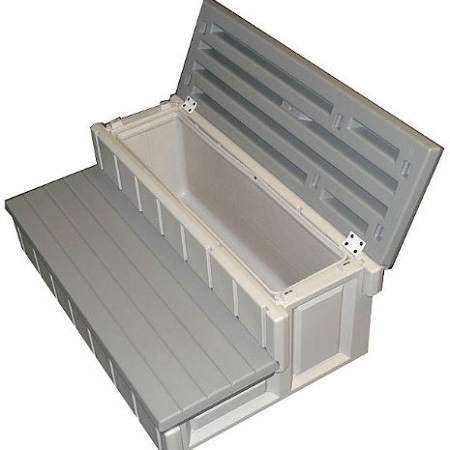 Perhaps the best thing about this spa storage step facility is that it has a weather proof and UV resistant design. The product is great for outdoor use and you don’t have to worry about your hot tub accessories going missing at the wrong time. The high-density polyethylene used in construction holds up longer than traditional wood. Yes, you can use the steps for stepping in and out of spas and hot tubs and the material will not rot even after coming in close contact with hot water. 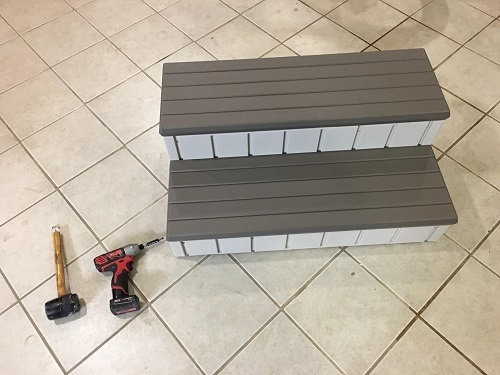 Customers say that the Leisure Accents spa step snap together easily, but you need to spend some time looking at the parts, which may look identical at first sight. So when your product arrives, try to have a little patience and take your time in assembling the steps. The hot tub accessories you keep in the spa step storage compartment remain safe all year round thanks to the weather proof and UV resistant design. 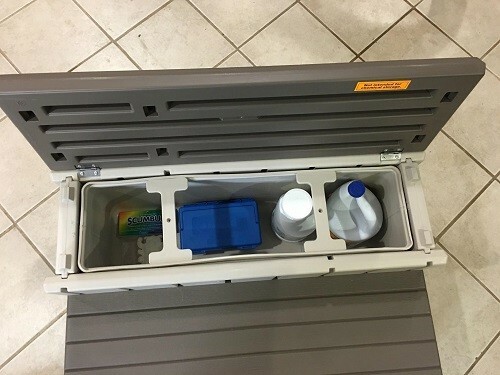 While it is safe to store all kinds of accessories, you should avoid keeping strong chemicals in the storage compartment. Most users are happy with the fact that everything kept in the steps stays safe and dry whether it is raining or snowing outside. 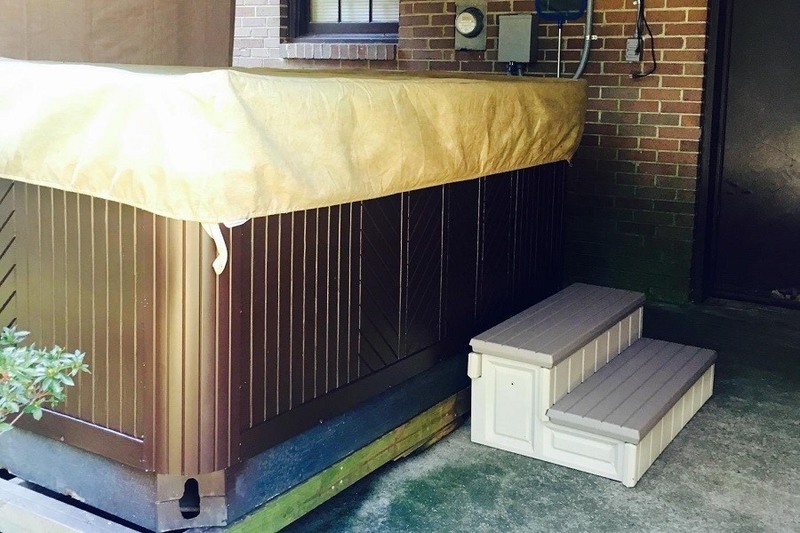 Because the steps come in two exciting colors, it is easy to create the exact kind of finish and look you want for your home spa or hot tub. The good thing about this Leisure Accent spa step is that it provides just the right amount of height that is needed. Yes, the steps are not awkwardly tall or wide and there’s enough space in the storage compartment to keep accessories such as towels, sun block and even spa games like plastic cards and a floating chess table. While the product is constructed using sturdy plastic, some customers’ say that the steps flex slightly and they don’t feel comfortable stepping in and out of the tub. This is especially true if the customers are standing in the very middle. Majority of the customers found Leisure Accents Spa Step to be solid. Since the top of the step will be firmly hinged to your spa or tub, you don’t have to worry about the product sliding out of place. More importantly, the steps have a nice texture and you can easily hop in and outside the hot tub without the risk of fall or injury. This versatile accessory is available for purchase from Amazon. The best thing is that you don’t have to spend a fortune. Costing a little under $150, Leisure Accents spa step can be delivered to your home free of charge if ordered via Amazon. If you’ve been looking for a durable, sturdy and long-lasting product that can help you get into your hot tub and at the same time keep all your spa accessories in order, look no further than Leisure Accents Spa Step with storage compartment.